Since 2005 I’ve had house/pet-sitting jobs in Southern California and have always maximized sightseeing in the area. My first Sunday afternoon at the pavilion in Balboa Park where the Spreckels Organ is housed was in 2006 when my sister Mary Hunt and I attended the weekly concert. The organist plays all types of music to demonstrate the wide range of the organ. The only experience that even compared with those concerts was listening to the organ in the Mormon Tabernacle in Salt Lake City, Utah. Since that first concert, I always place a trip to the Balboa Park for a concert on the sightseeing list for all my guests who join me in the San Diego area. For further information on the Spreckels Organ, go to (http://www.sandiegohistory.org/bpbuildings/organ.htm). 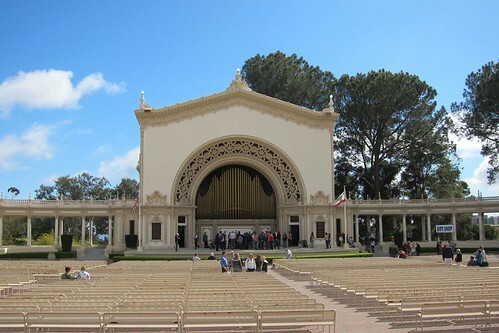 To view a slideshow of the Spreckels Organ Pavilion, click on the photo. If info about the photos is not displayed in the slideshow, click Show Info.